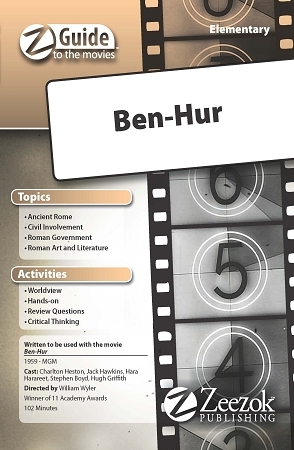 Zeezok Publishing's Elementary Z-Guide to Ben-Hur is a great way to incorporate media into your study of Medieval Europe. The Romans having allied themselves with the Jews following the successful Jewish revolt against the Greeks led by Judas Maccabeus begin to assert more and more control over the Jews in the first century BCE. By AD 6 Rome has taken complete political control of Judea. Several unsuccessful attempts to expel the Romans including the misguided Jewish belief that Jesus Christ had come to be their political Messiah result in harsh Roman reprisals and the Diaspora (scattering of the Jews). The Jewish people continued without a homeland until the reestablishment of the nation of Israel in 1948. This Z-Guide contains a topic overview a movie synopsis and ten learning activities for an in-depth study of the film. Learn more about Roman chariot racing identify elements of Roman government found in the film write poetry or try your hand at a Roman mosaic. Evaluate your own beliefs with the Worldview Activity and get the entire family involved with the For Family Discussion section at the end of the guide. Choose those activities which best fit your students course objectives areas of interest or time schedule.